Advertising is a method of a blogger for profit as a source of funds to support the needs of its Internet itself, but not a few of those whose lives have been relying on income from Adsense or advertising sites, for example just from my blogger friends are able to make their blogs as a land of living income. Not everyone can gain maximum benefit from the many bloggers who are already experienced but most of them do not understand also about the potential placement of AdSense ads that can make income becomes larger, ie with How to put Adsense in the right position That is usually above the blog article or under Title Blog Postings also under articles Blog Posts. 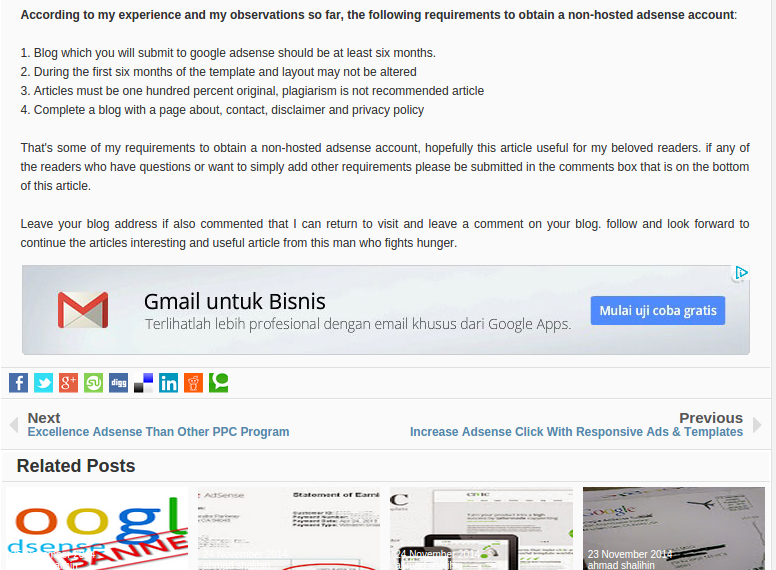 For that I will here explain how advertising (Google Adsense) under the title of a blog post or on the blog article. 1. Log in your Blogger Account. 3. In the template editor, please search code <data: post.body />, in order to search code fast, please press CTRL + F on your keyboard and copy the code and press enter. 6. Do not forget to replace the words 'Put your already parse ad here' with your adsense ad script code that you have already parse, and click save. the ad will appear in the bottom of the posting and parallel to the initial paragraph. If you want to change the position of the ad from left to right you can change the code <div style = "float: left"> to <div style = "float: right">. I hope the article How to Put Ads Under Blog Article Post will useful to you. If there are not clear please feel free to comment. Thankyou.